Shane has tackled the immense job of re-numbering all of the stones in the studio – this has been a huge task that started last summer with Pauli Meyer and Virginia White doing a complete inventory, Emma O’Leary assisting with the data entry, and now Shane is working on the actual re-numbering. Stacy has taken on the less than exciting (but critical) job of inventory and re-organization of some of the many materials we have here. Over the past year, we have added a lot of materials to the studio – and she has been working her way through it all to get it entered and counted. The paper drawers are now beautiful! Natalie has completed the cleaning and re-conditioning of our ‘new’ flatbed offset proofing press!!! We just started working with it, and there are still a few bugs to work out. But it works!!! This is a learning process for all of us here, but so far it’s been fun. And we are super excited to have it going – stay tuned for more updates as we progress! In other news: the Museum of Printing is moving to a new location in Haverhill, MA. As part of that move, they had a huge clearance sale. Frank Romero and the rest of the gang there were very generous and allowed me to go back in to the book stacks and pull out several books of interest to the print geek in me!! 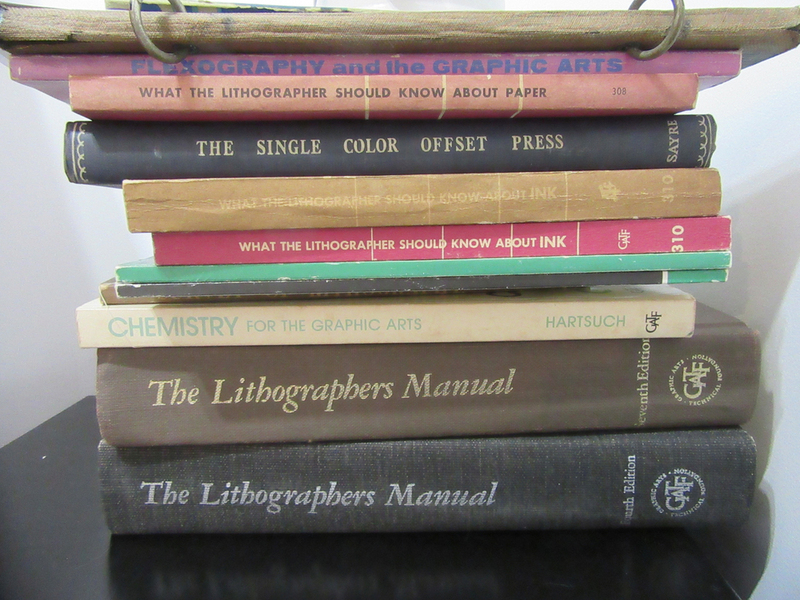 Many of them were published by the Graphic Arts Technical Foundation, Inc., which was located just up the road from my undergraduate school, Carnegie Mellon in Pittsburgh, PA. As I find the hidden gems of wisdom in some of these texts, I’ll be sure to share! !